Gird your loins for the return of Morrigan in Witch Hunt, the new DLC and "dramatic conclusion" to the story of Dragon Age: Origins. The most interesting twist in Dragon Age, in my ever-so-humble opinion, came very near the end of the game, when Morrigan finally made her play. Although a bit rough around the edges, it was a genuinely surprising turn of events that finally gave players a meaningful decision to make. This wasn't just a matter of choosing one generic dwarf prince over another; this was... well, we never really knew what it was. Until now. Witch Hunt, the new expansion for Dragon Age: Origins, takes place almost a full year after the death of the Archdemon. After disappearing into the mountains on the eve of the climactic battle, Morrigan has been spotted in the southern wilds of Ferelden. Finally, the time to confront her, and the dark secret she carries within, is at hand. Players will be able to import existing characters from either Dragon Age: Origins or Awakening into the new DLC or jump in with an all-new, high-level Warden to earn "powerful rewards" that can be used elsewhere in both Origins and Awakening. I'm not much of a Dragon Age fan but this sounds like an expansion I'll have to pick up. The chance to finish things with Morrigan, one way or another, in a "dramatic conclusion to the Origins storyline," isn't something I want to miss. 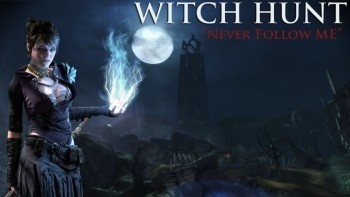 Witch Hunt is scheduled to come out on September 7 (yes, that's the same day as Lair of the Shadowbroker for Mass Effect 2; things must be busy at BioWare) for the PC (560 BioWare Points), Xbox 360 (560 Microsoft Points) and PlayStation 3 ($6.99).